(CBS/AP) LOS ANGELES - The lead defense attorney for the doctor charged in Michael Jackson's death has begun questioning the prosecution's key expert. Attorney Ed Chernoff on Friday began his cross-examination of Dr. Steven Shafer, who is beginning his fourth day as a witness. Shafer is a Columbia University professor and researcher as well as an expert in the powerful anesthetic propofol which is the drug blamed for Jackson's death. 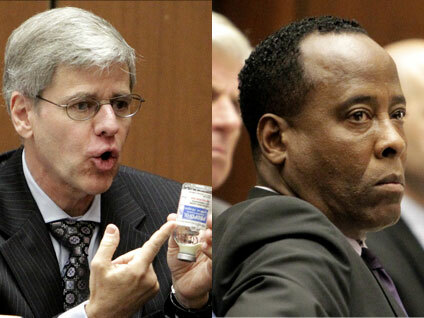 Shafer has told jurors he believes Dr. Conrad Murray is entirely responsible for Jackson's death. He believes Murray provided the entertainer with the anesthetic propofol and lacked the proper medical equipment. Murray has pleaded not guilty to involuntary manslaughter. After Shafer's testimony concludes, defense attorneys will begin presenting their case. Murray could face up to four years behind bars and the loss of his medical license if convicted.